Margaret Griffin McCombs: "Free to Roam"
Ketchikan, Alaska - "In my memory I've been revisiting the old family homestead which was located two miles from the village of Kasaan," Margaret Griffin McCombs wrote in her 1989 memoirs. "A footpath through stands of timber followed the beach leading to the 'ranch.' Someone had built a one-room log cabin on this site, and then abandoned it. So the Griffin family moved in and tried to eke out a living"
In 1917 when Margaret arrived at Kasaan with her family she was 10 years old. Her parents, Patrick and Julia Griffin, had seven children; Margaret was "number three after two older sisters." The Griffin family came from Washington State, where times were hard and jobs scarce. To make things worse, Margaret's father, a sawmill worker, had suffered an injury and could not work. It so happened that her mother's father, Jacob Leibrandt, had been homesteading, prospecting and logging on Prince of Wales Island in Southeastern Alaska. Grandpa Leibrandt wrote to his daughter and told her to come. 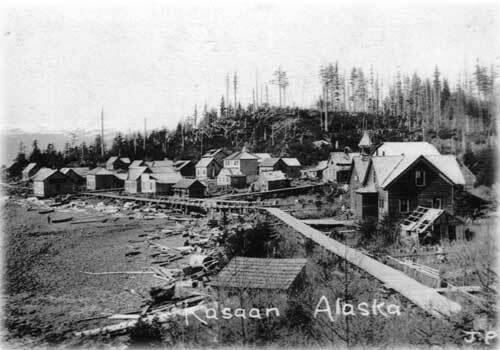 Near a village called Kasaan, he said, was a piece of land with an old log cabin that was available to homestead. When the Griffins arrived, however, they realized the log cabin needed more room for a family of nine-and repair work besides. They all pitched in and made the best of a bad situation, falling trees, splitting shakes, converting the cabin into "a three-room dwelling. Bunk beds solved the problem of sleeping so many children," Margaret wrote. The Griffin homestead stretched over 23 acres, five of which were cleared of trees, "the roots dug out with shovels, mattocks and axes." Margaret's mother Julia planted a garden and the Griffin kids were assigned daily chores-weeding, hoeing, hauling water from the well, chopping and splitting wood, raising and feeding chickens. The developed beach-front property facing Kasaan Bay came to be known as the Griffin Ranch. With "the Saw Tooth Mountains in the distance, the view from our home was magnificent," wrote Margaret, who today lives in Ketchikan's Sea View Terrace Apartments. Young Margaret loved nothing more than exploring her new surroundings at Kasaan. There were fascinating things to discover! Pretty sea shells, shiny rocks, wooded trails and wildflower meadows. But Southeast Alaska took getting used to. Born in Chehalis, Washington, Margaret and her sisters had never seen salt water before. Nor were they used to "rowboats that really floated. All those [that we were familiar with] were on lakes and had patches and bailing cans." Once living on the beach in Alaska the Griffin girls became fascinated by the wide-open watersand learned about boating the hard way. They decided to row a small boat across Kasaan Bay to go berry-picking. When they reached Sandy Point near Karta Bay, they anchored the boat with rocks and a shoreline, grabbed their sandwiches and berry buckets and headed for the woods. When they returned to the beach several hours later, they found their little vessel "riding serenely out of reach from the shore!" "After a discussion my sisters convinced me that I was elected to swim out and get the boat," Margaret recorded. She took off her clothes, swam out and hauled herself aboard. While rowing back to Kasaan, she and her sisters met a fishing boat whose skipper took pity on them and gave them a tow. In a 1996 oral history interview Margaret related another story about a dory boat that was owned by Grandpa Leibrandt. "My older sister came along and decided to row the boat down the shore. She was used to a lake where you pulled up a boat and it stayed there. Well, she pulled up the boat and walked off, and the boat walked off too-with the tide!" As she talks Margaret's jolly chuckle makes the story even better. But this particular situation did not end happily. The dory floated away, never to be found, which angered Grandpa Leibrandt so much he never forgot or forgave his granddaughter and held it against all the Griffin kids. A gruff old German who believed children should be seen and not heard, Grandpa did not approve of children playing and having fun. When Margaret's brother Sam built a playhouse for the younger kids, complete with a little stove and pans and kettles, Grandpa brought in a log, tied it to the playhouse and waited for the high tide to take out the log and the little house with it. "The children were saddened at the loss of their playhouse," Margaret wrote. "Sam especially had lost morehe felt Grandpa's antipathy toward him and his efforts. Grandpa fell in our estimation and regard." Still, "that first summer was beautiful. We roamed the beaches, swimming in the clean warm water and playing in the sand." The Griffin kids thrived and grew healthy on the ranch, fishing, boating, berry picking-and mountain climbing. On one mountain-climbing expedition, organized by Israel Stevens who lived on a neighboring "ranch," Margaret and her sisters hiked up Kasaan Mountain, a peak of 2,846 feet. They had plans to spend the night on the mountain. They started out in late-afternoon summer heat. By the time they reached timberline and made camp, however, the temperature had dropped. They gathered dead tree limbs, built two campfires and huddled together in the middle for warmth. "I wished for a heavier jacket and replenished the fires faithfully all night until daylight," Margaret wrote. The morning sun brought warmth and the hike continued to the summit. Margaret observed a "360 degree panoramic view. Facing south we could see Cape Chacon and the ocean. We marveled at the grandeur of Southeast Alaska spread before our eyes." As time passed, life on the ranch grew more difficult. The winter months were especially hard and it took hours of cutting wood just to keep the house warm. Finally the family gave up the homestead and moved to Kasaan village. At that time about 100 people lived at Kasaan. 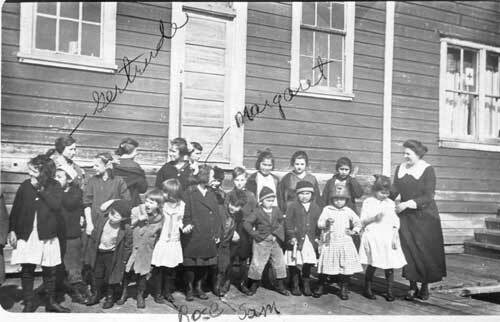 There was mail boat service from Ketchikan, a store, a four-line salmon cannery and a one-room schoolhouse where Margaret attended and became a "teacher's helper." She helped the teacher by splitting kindling, starting the early-morning stove and scrubbing the floor on Friday nights. In the summers Margaret worked at the cannery, putting in eleven-hour days for ten cents an hour, which earned her the nickname "Dollar-Ten." Her dad came up with the name, which stuck even after her wages rose. Although cannery work could be tedious, Margaret's jobs varied from "salt supplier" to "the patching table" (where fish was added to or subtracted from cans) to running the "clincher," a machine that put lids on and sealed the cans. Each year she was "promoted" and made more money, which helped supplement the family income. Her work at the cannery provided something else too: the opportunity to meet a handsome older man! Reuben McCombs was 13 years older than Margaret and came to Alaska on an old sailboat with his father. Reuben found work at a couple of mining operations in the Kasaan area-the Rush & Brown and Harris Creek Mines-then switched to cannery work. Margaret had seen Reuben around the village. "I thought him good-looking," she wrote. "He stood 5'8" and was slender with dark wavy hair and blue eyes flecked with gold." But Margaret was young, only 15, and shy and unsure how to get to know Reuben. During the winter of 1922 Reuben went trapping and when he returned started work at the cannery. It was not long before Margaret and Reuben met. Reuben began visiting at Margaret's home, invited her for walks and took her to dances and socials. When she started high school in Ketchikan, he traveled from Kasaan as often as he could. "He persuaded me to think of marriage," Margaret wrote. "We courted for a year-and-a-half and found a lasting love." 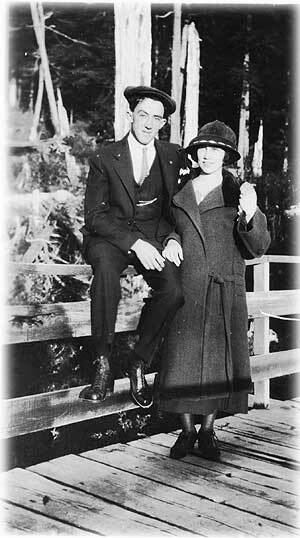 They married in Ketchikan on October 18, 1923, when Margaret was 16 years old. Soon after their marriage the young couple bought a home at Kasaan (from the Baronovich family) and continued to work at the cannery. By 1928 they had saved enough money to fulfill Reuben's longtime dream of buying a boat and being his own boss. They purchased a 36-foot double-ended troller called TREGO and worked on her until she shone with varnished built-ins, painted lockers and linoleum floors. They spent the first summer stationed at Lemisurier Point near Meyers Chuck, working as a fish trap patrol and earning $900 for the season. They used the money to outfit for commercial fishing. "In the spring we fished north and south of town [Ketchikan]," Margaret recalled, a far-away look in her eye. When fishing near town, "we had to ice our fish and bring it in to sell. But in the summer we went to Noyes Island and fished on the outside." At Noyes Island, off the west coast of Prince of Wales, various canneries set up fish-buying scows, where Margaret and Reuben could sell their catch, buy groceries, visit with other fishermen and not have to return to town. 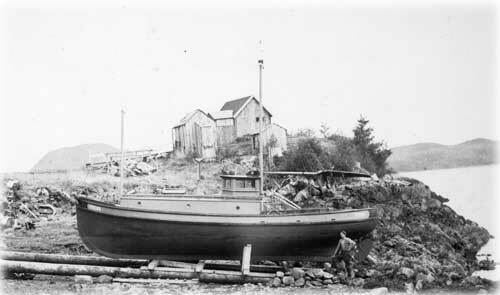 When World War II came along new military regulations were imposed on fishing boats. For one thing, when coming into port each boat had to report to the U.S. Coast Guard, which stationed guardsmen on the downtown dock. "So I came up and [local downtown business man] Harry Race was on the dock and I thought he'd lay an egg! It never occurred to him that a man would appoint a woman as the skipper. Whenever I'd see Harry after that he'd say, 'Where's the skipper? Where's the skipper?' It was funny." Reuben appointed Margaret "skipper" because she could do everything he could do - run the boat, operate the gear and clean the fish. She also did the cooking and cleaning and spent more time aboard the boat while in port. In the wintertime Margaret and Reuben went trapping. Their mode of operation was to anchor TREGO in a sheltered location (often Kasaan Bay or Twelve Mile Arm) and run trap lines along the beach. "We trapped mink, mostly, and land otters," Margaret recalled. "Some years the prices were good, some years they weren't. It was like the fishing - up and down." During the first season Margaret suffered from chilblains (sores due to cold) on her feet. She soon learned to dress more warmly, wear rubber boots and keep her feet dry. During the next trapping season Margaret's brothers, Sam and Bill, worked with her and Reuben. Margaret's job was to tend the rowboat while the men set the traps. "I'd ferry them from one place to the next. Put one ashore with traps and then drop off another one and then come back and pick up the first one." It was hard, cold, dangerous work but Margaret loved it. "Those days [of fishing and trapping] are jewels in my memory," she said. "I enjoyed being with Reuben and free to roam." In 1938 Margaret and Reuben fulfilled another dream. 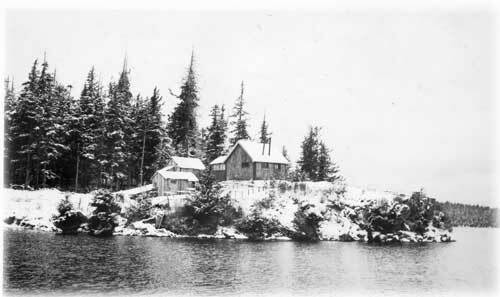 From old Captain Andrew Knudsen they purchased a homestead on Knudsen Cove, 15 miles north of Ketchikan. The homestead consisted of a small piece of property and an old driftwood cabin located on the cove's southern point, which Captain Knudsen had dubbed "Valhalla." Deciding they needed additional land to build on, Margaret and Reuben also filed on an adjoining home-site of five acres, making seven acres of property. In preparation for building, they took TREGO ten miles to Loring, where a few abandoned buildings remained from the old Alaska Packers salmon cannery. After salvaging timbers and parts of a bunkhouse and cookhouse, Margaret and Reuben loaded the material on a raft and towed it back to Valhalla. They began building in wintertime. Margaret described aspects of the process: "One stormy day Reuben built the brick chimney with a tarp overhead to catch the rain." Another time, "my brother Sam and I laid shingles and had to sit on them until we could get them nailed down!" At that time no road existed from Ketchikan, so building materials had to be transported by boat - nails, windows, wood for door frames. Still, by 1940 the home was completed. "We moved in on February 1st and had dinner as a celebration. Nothing was finished, but it kept out rain, snow and cold." Soon they completed a woodshed and boat house for TREGO and turned Knudsen's old cabin into a goat house. They also put in a chicken coop and a big vegetable garden. During the 1940s, two daughters, Yvonna and Marion, arrived. Margaret stayed home with them for seven years until both girls were old enough to go fishing on TREGO. Reuben helped build a little one-room school house near the cove called the "Clover Pass School," where Yvonna and Marion and other neighborhood kids attended. "So I raised goats and chickens and kids," Margaret said, with a characteristic chuckle. It took 11 years "to prove up on the [adjoining] land and get title to it." By 1955 Margaret decided the girls were missing too much as far as extra curricular activities at the little Clover Pass School. "I thought they'd be better off going to school in town," she said. So while Reuben continued to fish during the season (sometimes traveling as far as Icy Strait and Glacier Bay), Margaret and the girls found an apartment in Ketchikan. About this time the fishing industry took a downturn, prices dropped and Reuben had a disastrous year. To make matters worse, due to emphysema Reuben's health began to fail. So in 1959 the McCombs family sold the property at Knudsen Cove (to Ellis Airlines pilot Paul Mattle) and moved permanently to town. They rented first from E.C. Phillips, then a home on Grant Street, then into Austin Towers. "Reuben needed the elevator and the heat" at the Austin Towers, Margaret explained, recalling difficult times-both for Reuben and the family. To earn additional income, Margaret took a job at the Tongass Laundry, running laundry presses for $1.35 an hour. 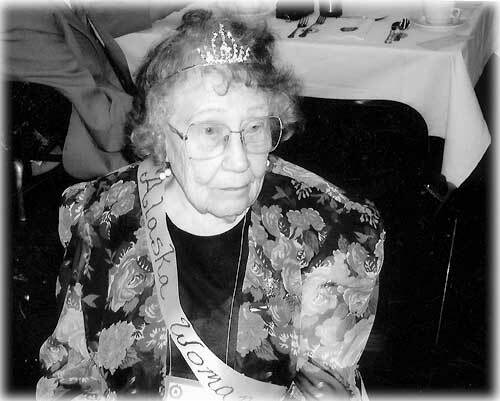 She also cleaned private homes and then became a custodian for the Ketchikan School District. In 1966 after 43 years of marriage Reuben died. It was a difficult time of adjustment. By now both girls had graduated from high school and Margaret made the decision to purchase a trailer home in town. She continued to work at various jobs-as a bookkeeper for Heckman's Department Store, for the Ketchikan Daily News in the circulation department and for Boyer Towing as a cook aboard the tug HEIDI H.
It's no surprise that her favorite job was cooking on the tug. Although the hours were long she didn't mind-she was back on a boat, traveling the waters of Southeast. "Twice on the HEIDI I was asked to hold a course while the skipper worked on deck," she recalled. "He was surprised to find on his return that I hadn't deviated from the course. Old fisher ladies do learn some things well!" In 1989 at the age of 82 Margaret completed a longtime goal. She received an A.A. degree from the University of Alaska, Ketchikan campus. The achievement still gives her a sense of accomplishment, pride and pleasure today. When asked what she's enjoyed most about her adventuresome life, she replied, "I enjoyed the first years when [Reuben and I] were free to roam. I enjoyed my children, glad I had them and all that, but I look back on those years when my husband and I were together, roaming around." In her memoirs she writes of how her brother Sam once returned to the old homestead at Kasaan: "He parted the thicket of young trees with his arms while trying to locate the old cabin. Those big old logs of the original building left no trace of their passing. I am saddened to think that all the labor we expended has ended in being reclaimed by the forest." Today she says she'd still rather live in the country, but at her age it's better to live in town. McCombs, Margaret. Personal memoirs, Ketchikan, Alaska: 1989. McCombs, Margaret. Personal interview, Oral History Project, Ketchikan, Alaska: 1996.